The Smoking Popes played SausageFest, one of the first outdoor festivals the summer last night. Here’s a review I did for the Illinois Entertainer of their latest CD. 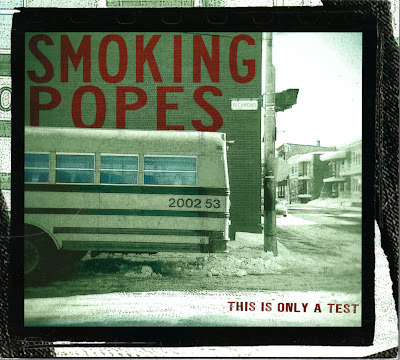 The Smoking Popes’ third release since reforming in 2005 is a sort of concept album that explores the mindset of the average teenager. Some of the tracks on This Is Only A Test may sound surprisingly commercial, especially for a critically acclaimed punk band. But lead vocalist-guitarist Josh Caterer consistently spikes his material with satire and a biting sense of humor. It’s hard to imagine Caterer isn’t poking fun at the jealous outsider of the title track, who envisions a post-high school dreamland where the jocks and cheerleaders have fallen from grace and geeks rule. The suitably energetic “Punk Band” is a funny look at rock star aspirations, while “College” presents a kid who dismisses higher education as a trap set by The Man. Smoking Popes even spin mononucleosis symptoms into engaging power pop on “I Got Mono.” Not everything on This Is Only A Test is played for laughs. The catchy “How Dangerous” promotes self-confidence while the mostly acoustic “Letter To Emily’ deals with teen suicide.